Truly though, it did take me a while because I just couldn’t think of an appropriate debut dish. To peg her down to one dish is impossible since she doesn’t have just one that everyone or even anyone would say is her. I asked siblings and others who know her well, “If Bunny were to die in a fiery ball of a crash tomorrow, what one dish would you miss her making?” After the looks of horror and snorts of righteous indignation (whatevs; I was looking for a visceral response), I got … nothing. She just cooks well. She’s one of those people who can read a recipe and just know what the dish will taste like and what will go well together. And other than her one foray into the depraved depths of cafeteria cooking, the evil world of liver and onions – a day which lives in infamy for two of her children and her youngest sibling who had to sit at the kitchen table for nigh onto four hours because she was too stubborn to admit that no human being should be required to eat a flubby slab o’offal smothered in onions!!!! – she hasn’t really erred too much in the kitchen. Might I point out that the liver and onions event was so long ago that dinosaurs roamed the earth and yet I still remember it like yesterday. Food memory is a huge part of us. Take heed you offal cookers! Pun definitely intended. Par for the course, I’ve strayed. Anyway, I finally just asked Bunny what she wanted to make and she said that she’d really like to make Nonnie’s minestrone. This is her Nonnie, my great-grandmother aka Old Nonnie. Great! says I. Bring the recipe and we’ll get right on it. Well, says she, I don’t have a recipe. In fact, I haven’t had the soup in about forty years; but I always loved it. Ah, says I in my thought bubble of a head, this is going to be fun. “Oh”, adds Bunny brightly, “There were also some eggy sort of crouton things that weren’t croutons but were made with cheese that go on top. And they don’t dissolve in the soup.” Aunt Dot calls them CHEE-co-lah … Oye again. 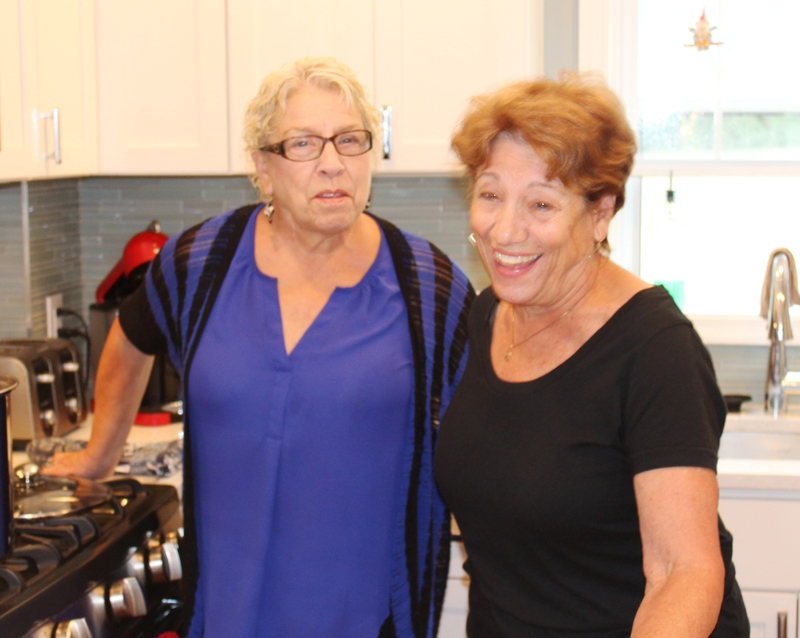 Dot (left) and Bunny (right) … My afternoon in the kitchen with them was like trying to herd cats. Fun cats, declawed and all purry, but cats nonetheless. After several weeks of back-and-forth with Bunny and a few phone calls and taste tests with Aunt Dot (all of which led me to be more confused than when I started), we have come up with what the OBs (Old Broads … something that I can call them from afar …Mwahahaha) believe is a very close reproduction of Old Nonnie’s minestrone with egg cube things (which don’t have a name yet but heretofore will be referred to as croutons and yes, please do argue that point in comments; I really would like a few comments) that is truly a delicious soup. It’s a time consumer but was a great way to spend the day with Bunny. Between stages, we went to the Italian Store to get bread to go with the soup (and a few gelati for the long-suffering locusts who accompanied us) and a stop at Pensey’s Spices for a refill on a few necessities and an introduction to Bunny which she rather enjoyed (though her pockey-book may not have). Once I figure out a dish that screams BUNNY! I’ll be sure to get on the ball with it. In the meantime, I thoroughly enjoyed a day cooking with Mom and hearing stories about Old Nonnie and the others. When I was chatting with Aunt Dot the morning before Mom got to my house to cook, Aunt Dot was laughing and said, “make sure to have your Mom tell you about almost being May Day queen.” Funny what sorts of conversations stir up memories. However, note to self, don’t ever do what a person tells you to do when they are laughing. My mother was not the May Day queen. She had that honor boosted from her just seconds before she was to parade about the family farm, Terra Maria (Land of Mary), by a sniveling cousin. There’s still a bit of indignation there. Hopefully, the big bowl of minestrone with the properly non-dissolving egg thing without a name on top and a wonderful hunk of Italian bread brought Mom back to Old Nonnie’s kitchen, the smells and tastes, the warmth and love. Food is a powerful memory holder and now we’ve got a bit of Nonnie’s love to pass along. Mom, Aunt Dot, and Uncle Frank gave the soup and croutons two-thumbs up and Aunt Dot declared it a “wonderful food remembrance.” So, there you go…. Enjoy this trip down memory lane. This soup is a day-long adventure. It’s neither difficult nor daunting. Put the chicken in the pot with all the goodies needed for the stock and then move on … This is an excellent rainy day or football day dish to make because the house will be warm and smell divine and the pot at the end of the rainbow is sure to please. 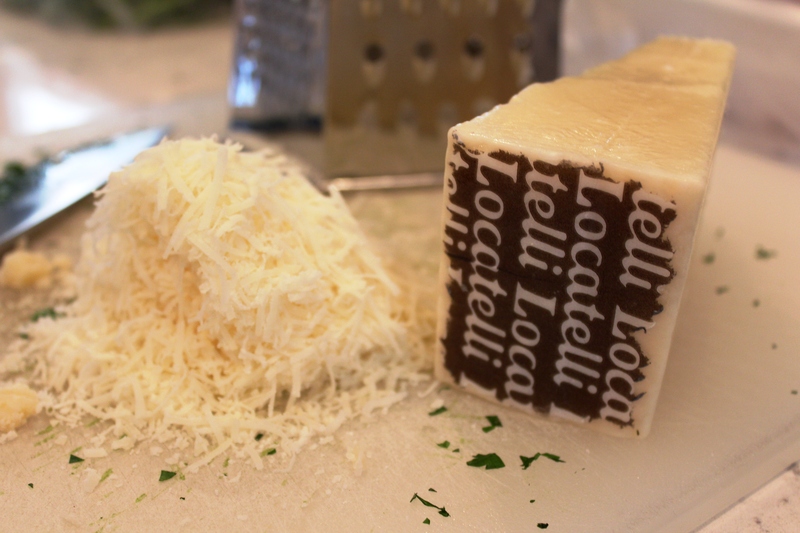 This is Locatelli Pecorino Romano. If the rounded edge is not noted with the name (and this generally goes for Parmigiano Reggiano and any of the other hard aged pedigreed cheeses) they are not authentic. It’s worth the extra money to get the real thing. And then grate lots of it. And then eat some of it with a nice red wine – cook’s treat! To borrow from the French, get your mise en place in place … just prep everything at once and use as needed. You’ll need plenty of Romano, garlic and parsley for this recipe. While the chicken is simmering away, prep the meatballs. You’ll use a bit of the garlic, Romano, and parsley here. This is a very wet, loose texture. When you roll them, it’s more of a plop-plop from hand to hand to get the rounded shape. If you try to roll like Play-Doh, you’ll have an unpleasant schmear on your palm. Be gentle. Put the meatballs on a very well oiled sheet pan. I am a foil lover since I am a cleaning nut that is lazy. Once you put them in the oven, wait for the mingling loveliness of aromas of the chicken and the meatballs. And once the croutons go into the oven, prepare to be amazed! Onto the croutons. More of the Romano, garlic and parsley. These flavor ties really become apparent when you have them all together in the bowl. Typing this is rather difficult since I have none to nibble on for inspiration while typing. I see another pot in my near future! 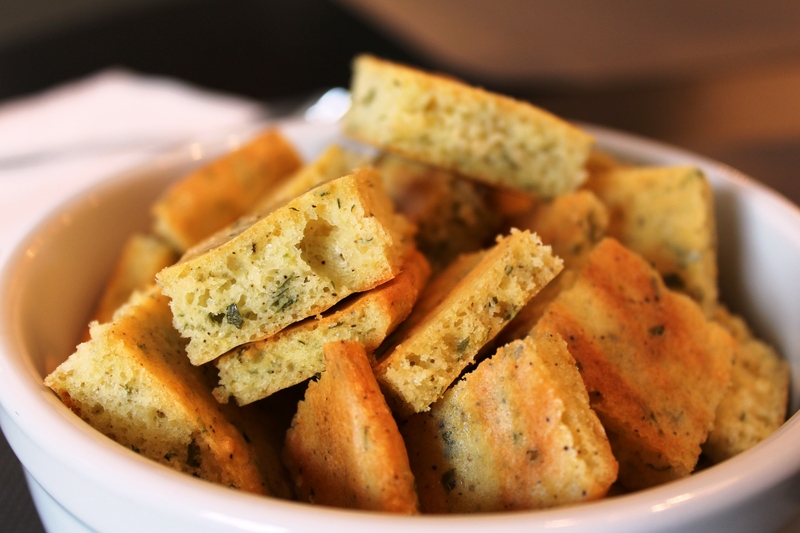 The croutons can either be smeared on a sheet pan covered in parchment or into a very well oiled 9×13 pyrex or other stick-free pan. They are a bugger to get loose otherwise. When done, the croutons will need to be cut when warm. If you wait until they are cooled, they’ll crumble. Still tasty but not as pretty. They should have no spring when they come out of the oven. They have the texture of a biscotti, kind of grainy and quite firm. Refill your wine glass and taste one of these fine little nibbles. Cook’s treat! The croutons … just because I figured out how to use the zoom without getting a woogy picture. Also helps to see the texture. The soup with a little drizzle of fruity extra virgin olive oil … this is where you can break out the good stuff because it doesn’t get cooked but the soup’s heat does help the flavor bloom. 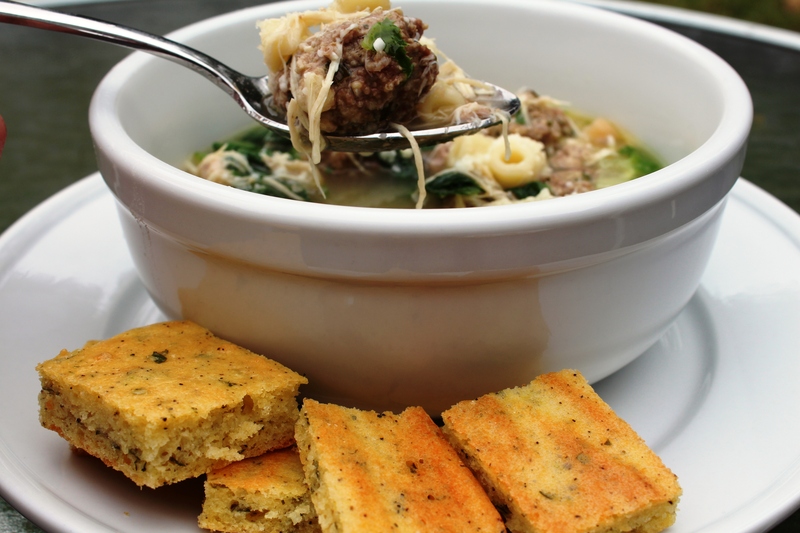 Add a sprinkle of the Romano and a few croutons and soup’s on! 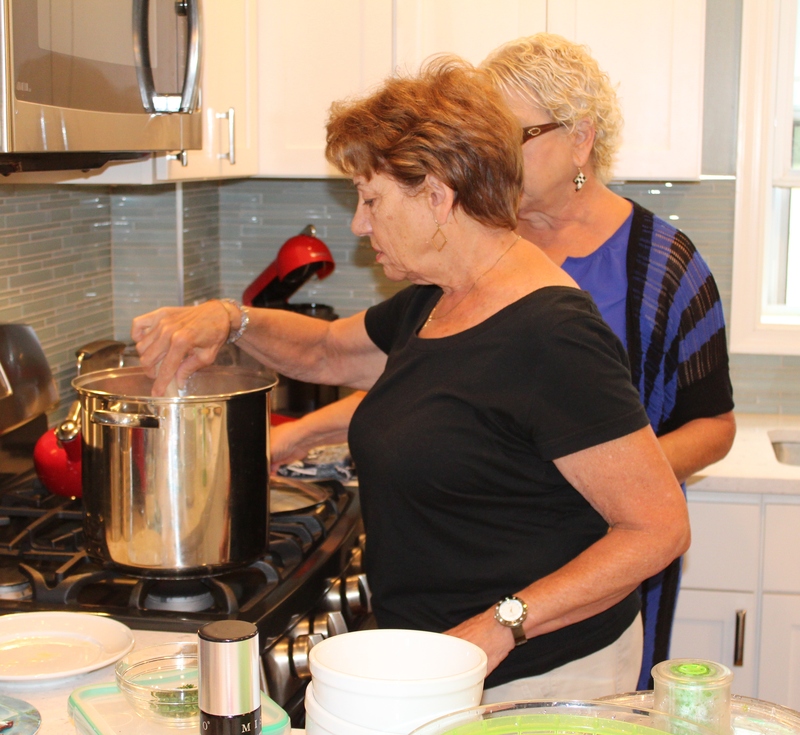 Mom and Aunt Dot are adding more escarole and giving the soup another once over before we eat. I had sweaty palms before they dug in. Taking on a memory dish is quite the endeavor. In the end, the soup was pronounced a hit and the old stories started a rolling, a sure sign that we’d done right by Nonnie. I hope you’ll give this soup a try. It really is tasty and it feeds a crowd … a great reason to invite over family and friends. Tell them to bring wine … you’ll be out. Enjoy! 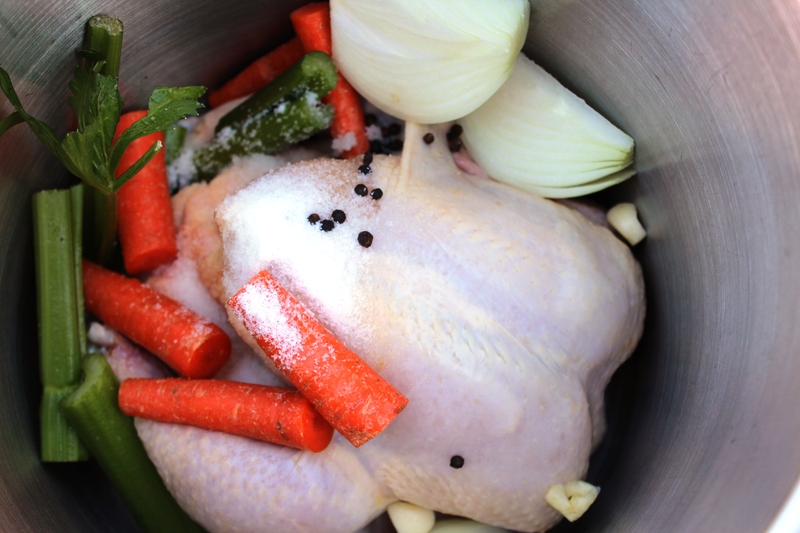 For the chicken and stock: Put the chicken and next six ingredients into a large soup- or stockpot with enough cold water just to cover. Put over high heat until it begins a gentle simmer and then reduce the heat to medium or medium-low to maintain that gentle simmer for 1 hour 15 minutes. Remove and cool the chicken carcass. Discard the vegetables. Strain the stock through a fine sieve back into the stock pot. This is easiest to do by straining from the original stockpot into another (or very large heat-resistant bowl and then back into the stockpot). Pick the chicken meat from the carcass. Cut any pieces that are large into bite-sized chunks but do not mince. Put the chicken back into the stock. At this point, it is not back on the heat yet. 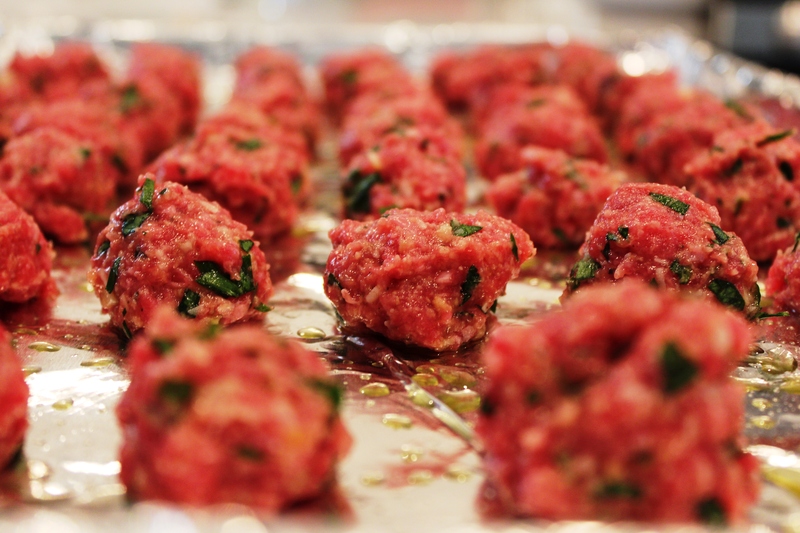 For the meatballs: While the chicken is poaching, prepare the meatballs. Preheat the oven to 375. Line a baking sheet with foil and a light coating of olive oil. 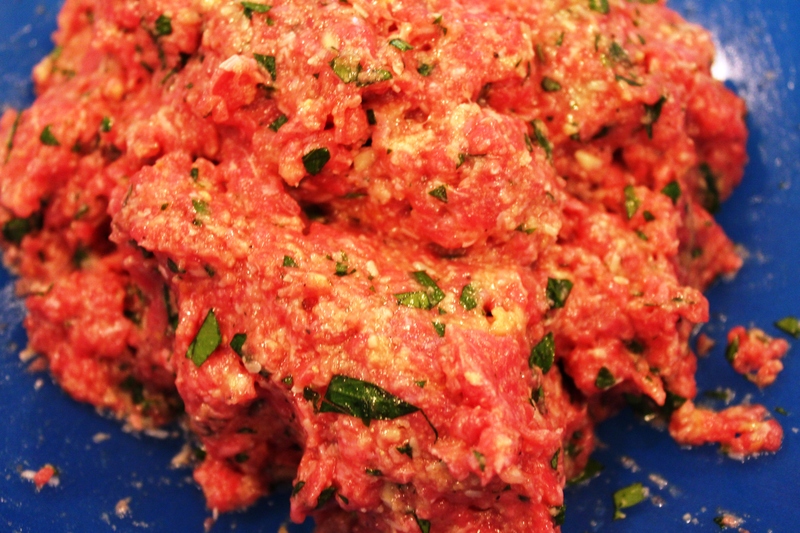 Put all of the ingredients for the meatballs except the ground beef into a bowl and stir well to incorporate. Once the ingredients are well combined, use your hands to gently mix the ground beef into the mixture. 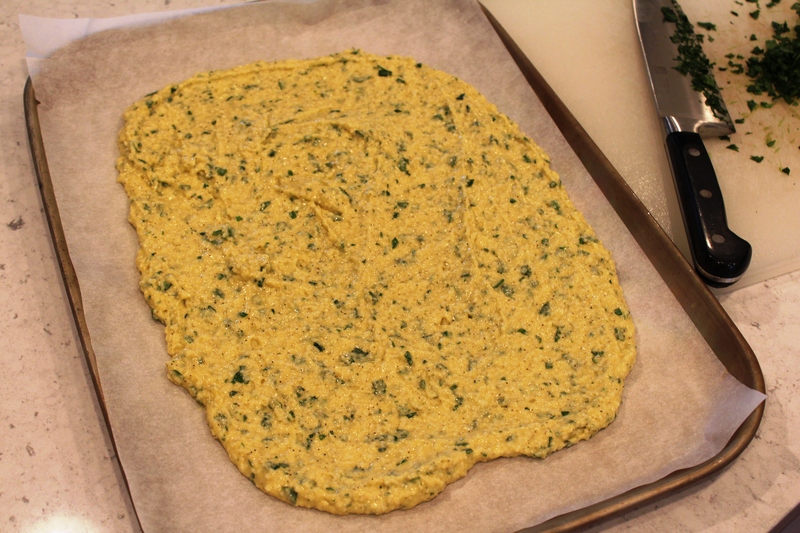 Scoop the meat by rounded teaspoons and roll into balls, placing on the baking sheet side-by-side but not touching. They should be bite-sized, about the size of a grape. Bake for 15 to 20 minutes, until just slightly browned. Once they have finished baking, drop into the pot with the stock and chicken. For the cheese cubes: While the meatballs are in the oven, prepare the cheese cubes. If the oven isn’t already on for the meatballs, preheat it to 325. Grease a small baking sheet with sides or a 9×13 Pyrex casserole dish. 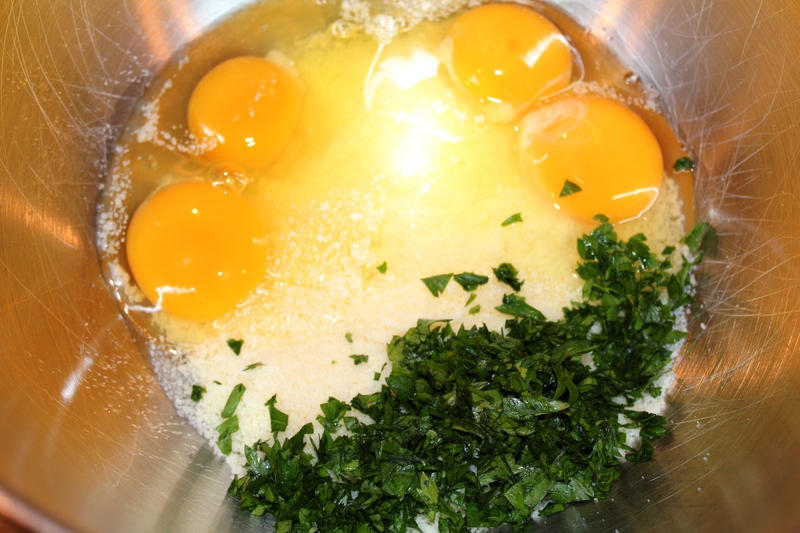 Mix the eggs, baking powder, parsley and black pepper in a medium bowl. Add the cheese, stirring well to combine. Add flour and mix well. It should be the consistency of a thick batter (think brownie batter, not cookie dough). If it’s too thin, add more flour 1 teaspoon at a time. Reduce the oven temperature to 325 (if it was at 375 for the meatballs). Bake until the batter has set and the top becomes a light golden brown color, about 30 minutes. Turn out of the dish immediately and let cool 10 minutes on a cooling rack. 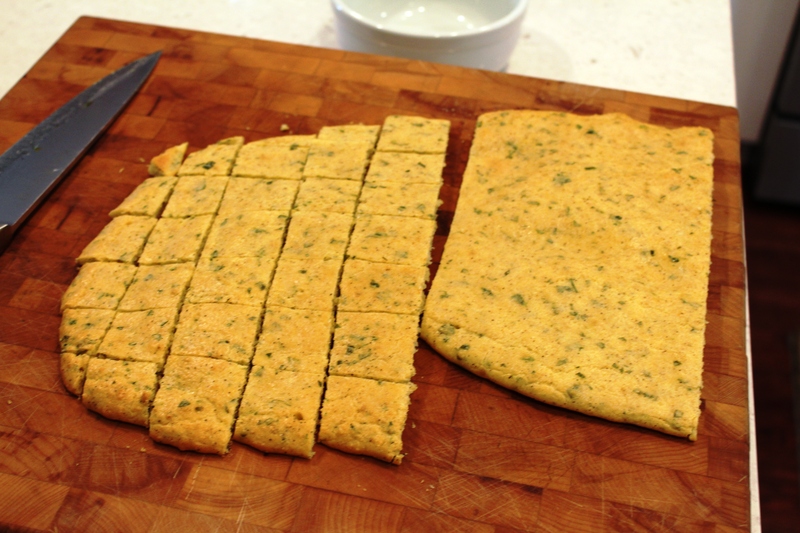 Immediately cut into small cubes, the size of generous croutons. These can be used immediately or stored in an airtight container. Return the stock with the chicken and meatballs to a gentle simmer on medium to medium low heat. Once the soup gets to a simmer, add the cannellini beans and dried pasta and stir. Let simmer together for fifteen minutes. Just before serving, add the escarole and stir. Ladle the soup into individual bowls. You can either top with a generous sprinkle of pecorino romano and a light drizzle of olive oil or have those ready at the table with the cheese cubes, a few of which should be set on top of the soup just before serving. If the fat content of the chicken stock concerns you, after you have removed the carcass and vegetables and strained the stock, cool it completely and skim any solidified fat from the top. Continue on with the recipe. 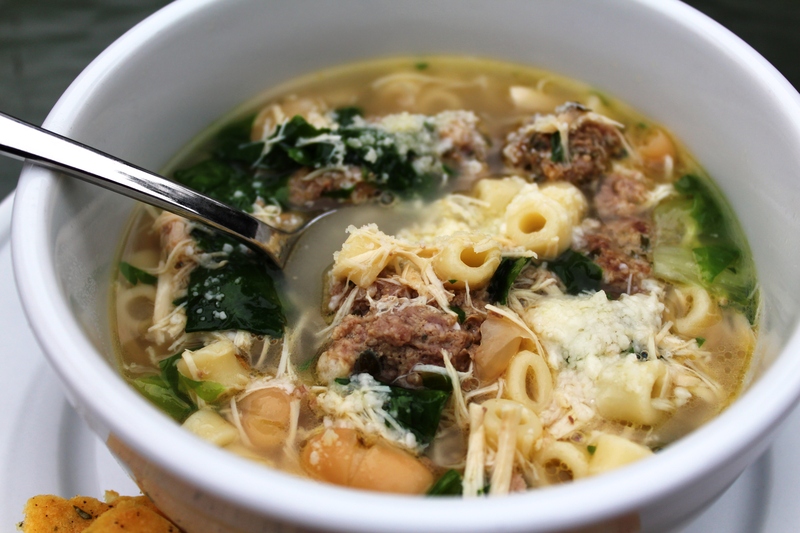 This soup is terrific to make early in the day or the day before. Just leave out the pasta and escarole until you reheat the soup for serving, adding the pasta once it comes to a simmer and allow to cook for 15 minutes and then the escarole just before serving. This soup is perfect as a make-ahead meal for the freezer. Simply prepare each component and freeze separately. When you plan to serve, defrost the stock overnight. Bring to a simmer and add the chicken, meatballs, and beans all at once. The pasta can be added once the soup comes to as simmer. As above, the escarole should be added just before serving. This soup can be made with Parmigiano-Reggiano but that could be quite pricey. Do not use the fake stuff in a can. Ever. For any reason. Please buy block cheese and grate yourself unless you’ve got a deli that you trust to not add fillers. Fillers can throw off the texture of what you are cooking. The soup is a terrific second day soup and freezes very well but know that the pasta will become slightly mushy; a guilty pleasure for me. This entry was posted in Beans, Italian, Main Dish, Nonnie, Soups and tagged beans, Cheese, Chicken, chicken soup, escarole, family recipes, family tradition, feed a crowd, Italian wedding soup, Itallian, leftovers, meatballs, minestrone, Naples, Old Nonnie, Parmigiano Reggiano, pasta, soup, Sunday dinner, tradition, vegetables. Bookmark the permalink. I love that photo! You were being happy and silly. And it was the only one where you both had your eyes open. I remember Pizza Keen – Old Nonnie made it in your house in LaPlata. I’m there! I’ve started the research … it’s also called Pizzzachena. Also, I want to maybe do struffoli. We’ll chat about the George’s contest. I can’t get it here in VA but will get some when I’m in Berlin next week.